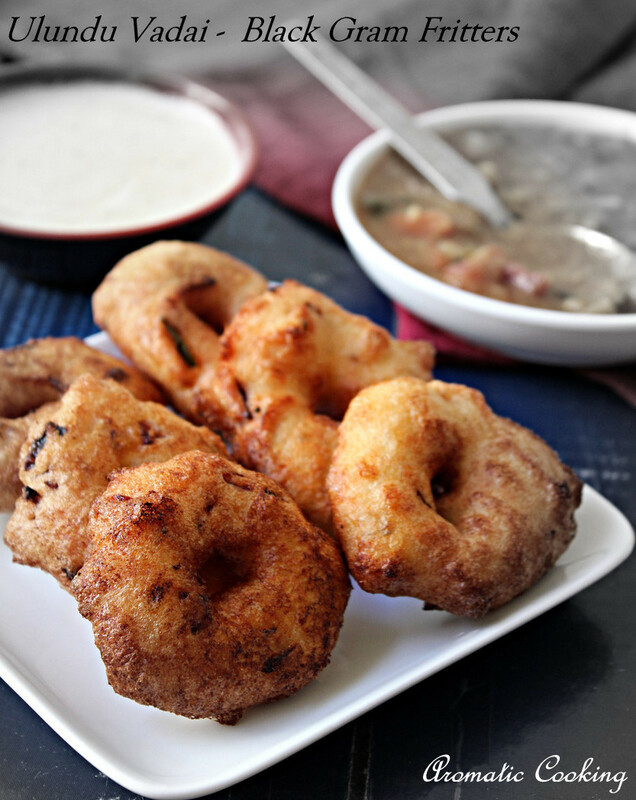 Vadais or Vadas are one of the most popular snacks of South India. It's made with lentils, the most popular ones being the Ulundu Vadai made with Black Gram and the Paruppu Vadai made with Bengal Gram. And then again, they take many avatars like the thayir/curd vadai, sambar vadai, rasa vadai, vazhapoo vadai and so on. They are not only popular as a mid-day or evening snack, but also made on most of the festival days as one of the foods offered to God. They are deep fried, but then a wonderful and tasty way of including lentils in kids diet and of course there is nothing wrong in, we adults, having a few, once in a while..
Soak the urad dal for 1+1/2 hours to 2 hours. Grind it with the green chillies, adding as little water as possible. 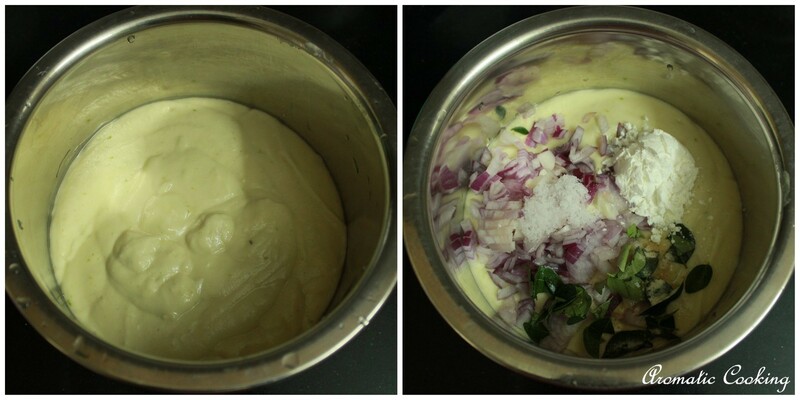 To this ground mixture, add the chopped onions, asafoetida, curry leaves ( torn into pieces) and salt, mix it. Add the rice flour if you find the batter a little runny, you should be able to take a big lemon size ball and flatten it slightly on your palm, if it holds it shape without spreading much, then it's okay. Heat some oil for deep frying. Now keep a bowl of water on the side, dip your right hand in the water, wipe your left palm with your wet right hand. 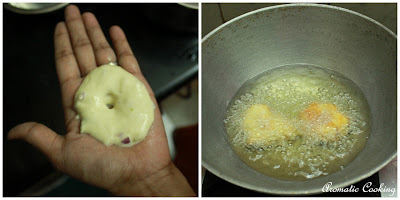 Now take the vada batter ( a little more than a lemon size), with your right hand, put it on your left palm, flatten it very lightly, dip your right forefinger in the water, make a small hole in the flattened batter(vadai) with the wet finger. Then transfer the vadai to your right hand, by placing your right hand fingers on the vada and flipping your left hand. Slide this vada into the hot oil, by flipping your right hand over the oil. Repeat the steps and drop at least 3 or 4 vadas in the oil (depending on the amount of oil you are using for deep frying. Cook the vadais till they turn golden, flipping them once in between. Remove them with a slotted spoon and drain the excess oil on a paper towel. Serve it warm with sambar or chutney or have it as such. The process of making the vadas might sound a little hard for first timers, but with practice, you can do the vadas in no time. If you dip your hands in water, each time and wipe your left hand each time before flattening the vadas, then the vadas will not stick to your hand. The dough should be of the right consistency, you should be able to pick a little dough with your wet fingers ( about a lemon size) and drop it in one-shot, it shouldn't fall little by little. If the dough is very thick, then the vadas will turn out harder, if it's too thin then it'll soak a lot of oil. Also for first timers, if you are not able to make the center hole, it's okay, you can skip that step and proceed or even pick a little batter with wet right hand and drop it into the oil, sometimes even I do that. You cannot grind the batter too thin and then add like 1/2 cup of rice flour, the vadas will turn out harder. Since I ran out of rice flour, I used corn flour instead which also acts as a thickening agent. When you drop the vadas in the hot oil, if it turns golden or brown within a minute, then the oil is too hot, the outside will be cooked but the inside will be uncooked batter, reduce the heat and then proceed. Do not soak the urad dal for more than 2 hrs, then the vadas will absorb more oil and turn out soggy, I learnt this from my personal experience. wish i could grab those from screen :) making me hungry now..
crispy and perfect color vadai Hema....keep rocking.. Delicious ulundu vadai Hema. my mom's favorite. tempting and yummy vada,u made it perfectly! 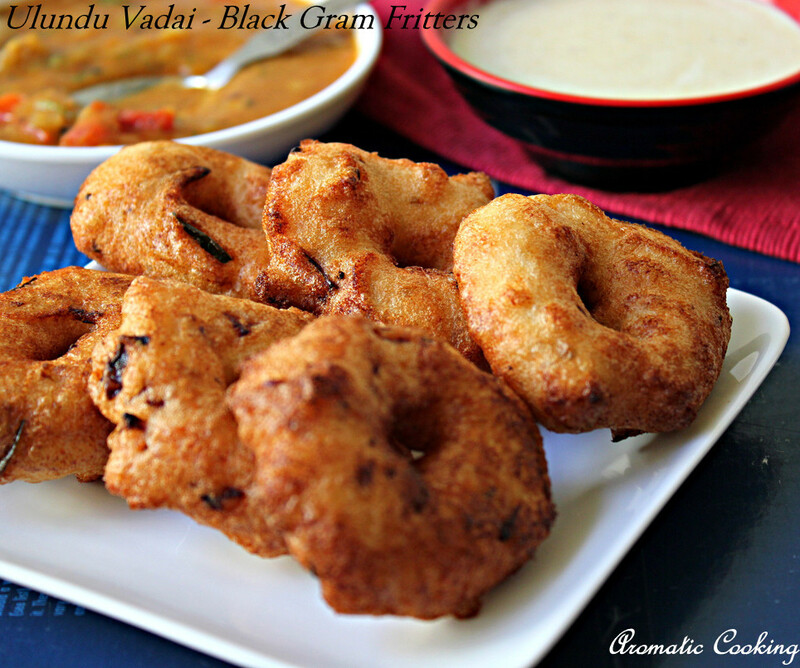 Send me some, love this irresistible vadais. Delicious vadai's. I only dream of making them these days. Crispy and delicious,My God,I can't stand them. tempting vadai hema, all time my fav..